TL;DR: In this series, you will learn how to create modern web applications with Python, Flask, and Angular. 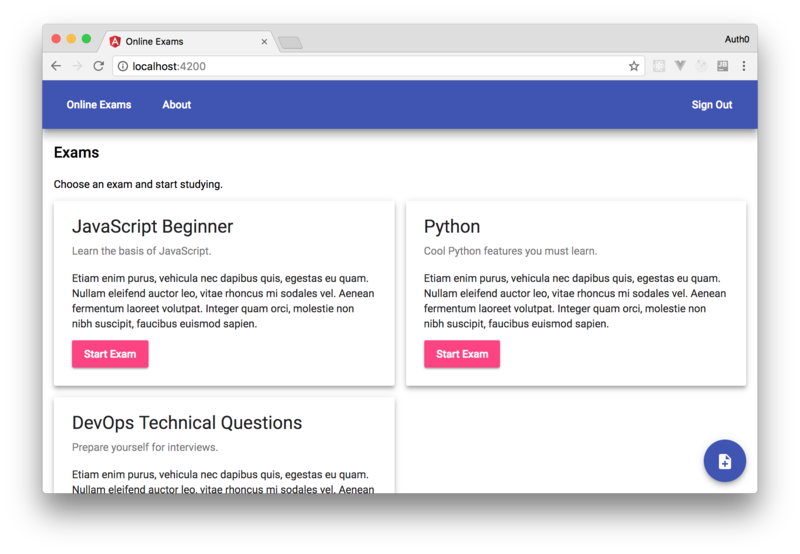 You will use this stack to build a SPA and a backend API to expose exams and questions so users can test their knowledge regarding different technologies. In this GitHub repository, you can find the final code created throughout the third part of the series (this one). Part 2 includes topics like securing Flask Apps, handling Angular forms, and securing Angular Apps. Part 3 (this one) includes topics like configuring Angular Material, handling Authorization, and migrating Databases with Alembic. In this part of the series, you will start by installing and configuring Angular Material to add a nice interface to your app with ease. Then, you will use Angular Material components like Button, Card, Dialog, and Toolbar to enhance the look and feel of your application. After that, you will refactor both the frontend and the backend apps to support some more features like question management. Throughout the process, you will learn how you can take advantage of roles to limit what some type of users can do. For example, although it might be a good idea to let the community help adding new exams and questions, you will want to restrict which users can update and delete existing ones. The official website contains some good documentation on how to install, configure, and use Angular Material on Angular applications. However, for newcomers, the information might look a little scattered. So, in this article, you are going to focus on what is needed to get up and running with this UI (User Interface) component framework as fast as possible. You will need the first two libraries in the command above, @angular/material and @angular/cdk, to use Angular Material in any application. You will also install the third library, hammerjs, to add gesture support to your app. git add . && git commit -m "installing and configuring Angular Material"
Now that you finished configuring Angular Material, you can move forward and make use of the first components to build an appealing UI. More precisely, you will start by using the Toolbar and Button components to add a navigation bar to the top of your application. Note: In the code snippet above, you are using NoopAnimationsModule to avoid adding another dependency to your project. If you are interested in using animations, check this URL. Online Exams: You will make this button redirect users to the home page. About: You will create a view called About and make this button redirect users there. Sign In: You added this button to allow visitors to sign in to your application. Sign Out: You added this button to allow users to close their current session. What is interesting about these changes is that, since the AppComponent also defines where other views will appear (through the router-outlet element), the mat-toolbar element will be visible to all your views. That's it! If you run your application now, you will see a nice blueish navigation bar. Before proceeding to the next section, save your work! git add . && git commit -m "adding navbar to the Angular app"
"Using Angular Material is easy and straightforward." 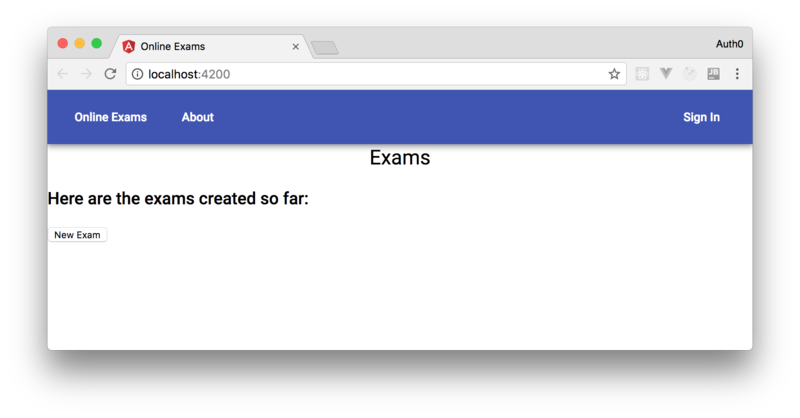 After adding a nice navigation bar to your Angular application, you can enhance the look and feel of the view that shows existing exams. In this view, you can use the Card component to show each exam in separately and some nice action buttons to enable users to add new exams and to start practicing their knowledge. Etiam enim purus, vehicula nec dapibus quis, egestas eu quam. Nullam eleifend auctor leo, vitae rhoncus mi sodales vel. molestie non nibh suscipit, faucibus euismod sapien. 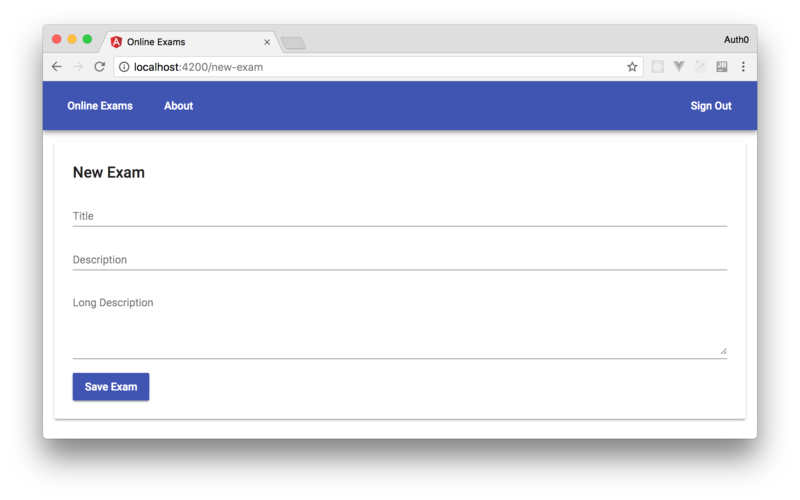 In this version of the ExamsComponent, you are iterating over the examsListretrieved from the Flask application to create mat-card elements. Each of these elements is composed of a mat-card-title to show the exams titles and a mat-card-subtitle to show its descriptions. Also, you added a p element with some placeholder text to simulate the long description property of the exams. Soon, you will replace this placeholder with real data retrieved from the backend. Still on the mat-card elements, you are adding a pink action button (<button mat-raised-button color="accent") that will enable users to start taking the exam in question. Lastly, you are adding another action button, this time blue (<button mat-fab color="primary" ...), to enable authenticated users (*ngIf="authenticated") to access the form where users can add new exams. These CSS rules take advantage of the Grid layout system to show two columns of exams on large devices and a single column on smaller ones (max-width: 720px). It also defines that the button to add new exams will stay fixed on the screen on the bottom right corner. In the screen, the user is signed in (hence, the Sign Out button and the action button to add new exams) and there are three exams persisted on the backend. git add . 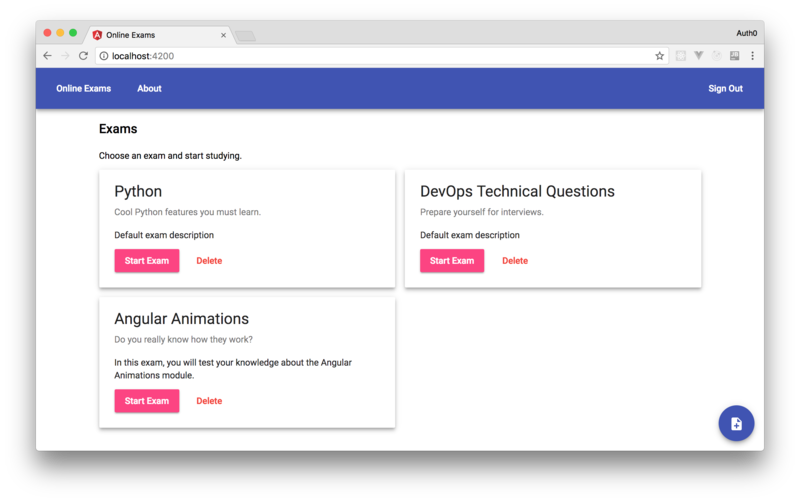 && git commit -m "using Angular Material Cards and CSS Grid layout to show exams"
Now that you enhanced the UI of your application, it's time to enable users to remove existing exams. To do that, you will categorize your users into two groups: admin and user. To make things easier, you will just define that your own user (i.e. the one that contains your email address) will be the admin and everyone else will be set as a normal user. You will handle this logic through Auth0 Rules. So, open the Rules section on your Auth0 dashboard and hit the Create Rule button. Then, in the Pick a rule template page, click on the empty rule option. After that, Auth0 will redirect you to a form with two fields, one to input the name of the rule (you can call it Online Exams Roles) and one to input its source code. // Roles should only be set to verified users. This rule is quite simple. It just checks the email address of the user that is authenticating and, if it is bruno.krebs@auth0.com, it sets the admin role to them. If it is not this email address, it sets user as the user's role. You will want to replace the email address used in the code snippet above with your own one. Note: The namespace identifier used above can be any non-Auth0 HTTP or HTTPS URL and does not have to point to an actual resource. Auth0 enforces this recommendation from OIDC regarding additional claims and will silently exclude any claims that do not have a namespace. You can read more about implementing custom claims with Auth0 here. What this code does is to define a decorator called requires_role role that takes one argument: required_role. Then, with this argument, it creates a wrapper around the annotated function that checks if any request reaching it contains a valid token with the required_role. Note: It is important that you use the same namespace (e.g. https://online-exams.com/roles) used while creating your Auth0 rule. If the token in question contains the expected role, the wrapper calls the original function (the endpoint). Otherwise, it raises an AuthError stating that the user lacks privilege. Here, you are simply defining a new endpoint that accepts DELETE requests to remove exams. These requests must contain the exam id (<examId>) and must be issued by a user with the admin role (@requires_role('admin')). If these premises are fulfilled, the endpoint fetches an instance from the database and use it on the session.delete call. The code in this new method is trivial, right? It just calls the delete method, on the HttpClient instance, pointing to the endpoint that you created in your backend. As you were probably expecting, you need to add the access_token to this call so your backend can validate it and its roles. The only difference on the template of this component is that, now, it includes a Delete button that is showed to admins only (*ngIf="isAdmin()"). When clicked, this button calls the delete method to issue the DELETE request to the backend. Then, when the request finishes, this method calls the getExams method on examsApi to update the list of exams. That's it! It was easy to use roles to control who can delete exams and who cannot, right? git add . && git commit -m "enabling admins to delete exams"
After dealing with authorization and roles, you will want to improve your application adding new features. As adding new features usually means making changes to your database (so it can support these new features), you will need a database migration tool to upgrade the database schema. Why? Mainly because you don't want to lose your data when upgrading and because you want to keep track of the changes in the long run. This command will create most of the files in the migrations directory. You won't need to touch the files in this directory now. Actually, the one file you will need to change is the alembic.ini file that resides outside it (you will find it in the backend directory itself). alembic revision -m "add long_description to exams"
Note: This migration defines that the long_description column does not accept null values and that its default value is "Default exam description". So, any exam previously persisted in your database will have this value in the long_description column. 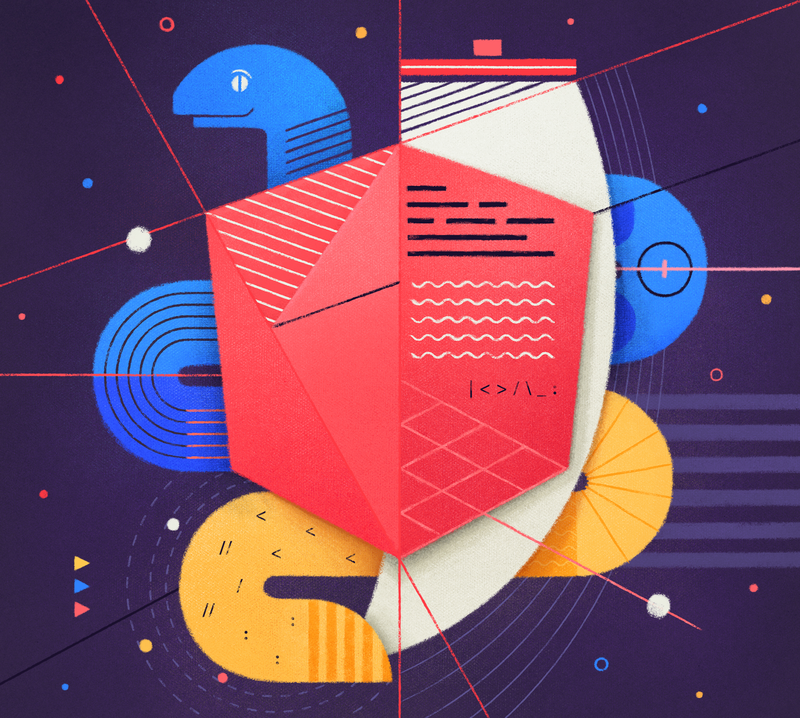 With these changes in place, your Python backend application is now ready to persist long descriptions of exams. So, in the next section, you will refactor the frontend app to support it as well. Note: Here, you learned just the basics about Alembic. For a much more complete explanation of how it works and what you can do with this tool, check the official Alembic documentation. Time to save your progress! git add . && git commit -m "configuring alembic and adding the long_description column"
The new version of this component includes a whole new template where you are using three Angular Material components: Card (mat-card), Button (mat-raised-button), and Form Field (mat-form-field). It also includes a CSS rule to make form fields (mat-form-field) fill all the horizontal space (width: 100%;). Lastly, it includes the long_description field in the exam variable and a method called updateLongDescription to update this field. git add . && git commit -m "supporting long_description on the frontend"
In the third part of this series, you learned how to install and configure Angular Material components. Then, you used these components to add a nice interface to your Angular application. After that, you learned how to use Auth0 rules to add roles to your users and made both your backend and frontend projects aware of these roles. In the end, you learned about Alembic, a database migration tool, and used it to add a new property to exams: their long description. In the upcoming articles, you are going to enable users to add questions to your exams and you will also let them start taking these exams. Also, you will start preparing your code for CI/CD (Continuous Integration and Continuous Delivery) tools. 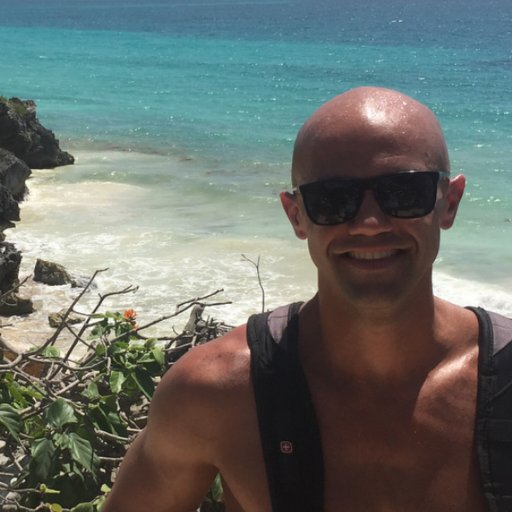 These tools will help you automate the development and release pipeline.